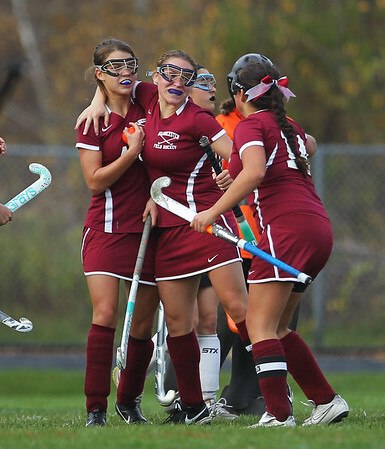 Gloucester sophomore Samantha Commoeilli, left, gets a hug from teammate Kayla Nasser, center, and Lily Jean Sanfilippo, right, after she scored the game-tying-goal against Ipswich on Wednesday afternoon in their D2 North first round game. DAVID LE/Staff photo. 10/29/14.